Panko breadcrumbs are a great low-salt alternative to regular bread crumbs that I’ve written about before. I use them in my turkey meatballs and turkey meatloaf as well as on my low-fat chicken parmigiana. Like most things low-salt, however, they routinely cost at least twice as much as comparable high-salt breadcrumbs. 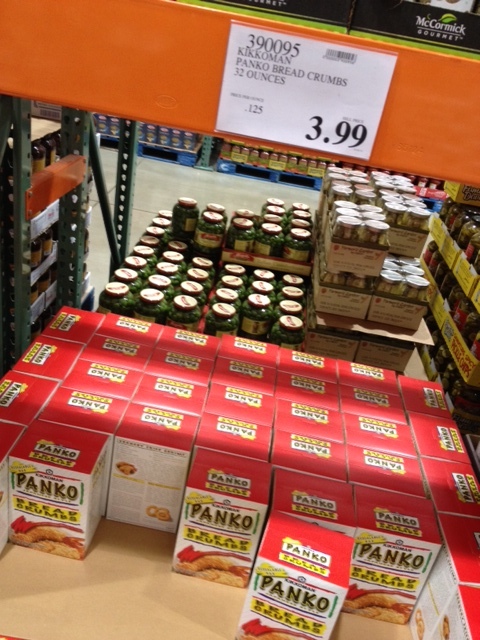 So I was thrilled to see that Costco is currently carrying mega-boxes of panko breadcrumbs, two pounds, for only $3.99. You could find yourself paying that much for half a pound at a regular grocery store. A half cup of these Kikkoman crumbs has only 40 mgs of salt and 2 grams of sugar with 0.5 grams of fat, making them a great ingredient for low-salt, low-fat, low-sugar recipes. When you see deals like this, scoop them up to save money on the always expensive low-salt items you need. And don’t rule out places like Costco when shopping for what you need, you never know when a deal like this might pop up.